The term “river herring” collectively refers to two species: Alosa pseudoharengus, commonly known as alewife, and the closely related Alosa aestivalis, commonly known as blueback herring, or simply bluebacks. Records dating back to the early nineteenth century indicate that fishermen could tell the difference between alewives and bluebacks, which look very similar; however, historically they have been harvested together with little regard to the differences between the two (Collette and Klein-MacPhee 2002). Alewives are the more common of the two species in most rivers in Maine (Collette and Klien-MacPhee 2002). Fishermen in Maine often use the word “alewife” to refer to both alewives and bluebacks. Both alewives and bluebacks are anadromous fish, meaning that they are born in fresh water, but spend the majority of their adult lives at sea. Each spring streams, rivers, and ponds in Downeast Maine fill with adult alewives that are ready to spawn. This seasonal influx represents a major linkage between freshwater and marine ecosystems and historically provided an important food source for Wabanaki peoples and European settlers. The origins of the name “blueback” are straightforward enough. The dorsal side of a live blueback is usually dark blue in color, as opposed to alewives, which usually have a greenish pigmentation. In both species these colors fade soon after the fish die (Collette and Klein-MacPhee 2002). The origins of the word “alewife” are inconclusive, revealing the confusion inherent in tracing etymology over centuries, continents, and cultures. The confusion is also symptomatic of the close relationship between river herring and their exclusively marine cousins, the Atlantic herring. Then there is the issue of the wife herself, the woman who keeps an alehouse. Some sources claim this is the origin of the name of the fish, while others look to Native American languages, or even old English and old French as the source. A letter written by J. Hammond Trumbell in 1871 and published in a report of the U.S. Commission of Fish and Fisheries refutes claims that the word “alewife” is derived from the Narragansett word aloof, reported by previous authors to mean “boney fish.” Allis shad is another name for the European shad (Alosa alosa), a close relative of the alewife. According to Trumbell, the old English word for allis was aloose. Trumbell speculated in his letter that when copyists transferred previous records regarding shad they mistakenly wrote aloofe for aloose. This, he contended, was the source of the assumption that the word alewife comes from the Narragansett word aloof, for bony fish, rather than the old English word for Shad, aloose (Trumbell 1873). The Mattamiscontis Stream, a tributary of the Penobscot River, derives its name from the Penobscot word madames, meaning alewife (Watts 2012; Nobleboro Historical Society 2013). Perhaps it is because of the word madames that the comparison to a woman was first drawn. Unlike their relative the Atlantic herring (Clupea harengus), which is a strictly marine fish, alewives and bluebacks are born in fresh water and spend most of their adult lives at sea (i.e. they are anadromous). In the spring adults return to spawn in the ponds and streams where they were born (though some do stray to neighboring streams). River herring harvests in Downeast Maine, both historically and currently, take place while pre-spawning adults migrate upstream in great numbers in the spring (Collette and Klein-MacPhee 2002). Alewives prefer to spawn in calm water and bluebacks usually prefer areas with faster currents. The spawning habitats of the two species often overlap, especially in areas where upstream passage is blocked (Collette and Klein-MacPhee 2002). Peak alewife spawning in Downeast Maine usually takes place in early to mid-May and peak blueback spawning is usually about a month later. The timing of the spawning migration is largely controlled by water temperature. Adults quickly return to the sea after spawning. Most individuals will spawn only once in their lifetime; however, some make the journey back to fresh water to spawn in multiple years (Collette and Klein-MacPhee 2002). Newly hatched young remain in fresh water for about two months before migrating to the sea (Atkins 1887). Alewives and bluebacks in Downeast Maine tend to spawn later in the year (i.e., mostly in May as opposed to April), reach reproductive maturity at slightly older ages (usually around age four), and are more likely to spawn in multiple years compared to river herring in areas farther south (Collette and Klein-MacPhee 2002). Written records, oral histories, and place names suggest the importance of river herring as a food source in Downeast Maine going back hundreds of years, if not longer. Traditional Wabanaki diets were (and to some extent still are) based on a variety of plant and animal species that were available at different times of the year. Most Wabanaki communities moved throughout the year to best take advantage of many species that were abundant in different locations at different times of the year. The spring and summer months were busy times for harvesting marine fish, invertebrates, and birds, as well as river-running species such as alewives, bluebacks, shad, and sturgeon (Harper and Ranco 2009; Maine Historical Society 2010). River herring were an abundant and important food source in the spring when they entered Downeast Maine’s rivers in large numbers and could be easily caught with weirs, traps, and nets (Collette and Klein-MacPhee 2002; Prins and McBride 2007; Harper and Ranco 2009). Each spring, large quantities of river herring were dried or smoked and set aside for later consumption. Many were also cooked fresh. Bones and what few other parts were not consumed were sometimes used to flavor soups and fertilize gardens (Harper and Ranco 2009). European settlers and their descendants in Downeast Maine harvested river herring for a variety of purposes. 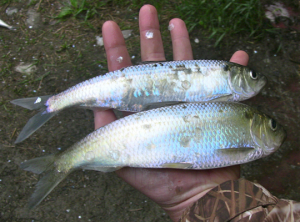 For these newcomers river herring were not only a food to be eaten fresh, salted, smoked, frozen, or pickled, but they were also used as bait to capture larger fish and lobsters, and were commonly used to fertilize crops (Collette and Klein-MacPhee 2002). Human consumption, however, remained the primary use during the eighteenth and nineteenth centuries (Atkins 1887). Many fishermen worked their own smoking shacks and sold smoked river herring to local markets. When harvests were especially large some fish would occasionally be pickled in barrels and sold to larger markets. River herring keep particularly well in pickle and those caught in Maine were shipped to Boston, New York, and on occasion even to the Caribbean. This process has been replicated in recent years by the Downeast Salmon Federation (a site on the Downeast Fisheries Trail) during an event called the “Bloater Bash.” The term “bloater” refers to whole smoked river herring. Though described as a “toothsome article of food” in 1887, in modern times river herring have largely fallen out of culinary favor. They retain commercial importance as a favored bait in Maine’s iconic commercial lobster fishery (Schalit et al. 2003). Recent work by Ames and Lichter (2013) provides evidence that several subpopulations of Atlantic cod, haddock, pollock, and white hake once existed in the Gulf of Maine and that the centers of these subpopulations were located at the mouths of rivers where young river herring once exited in large numbers. They argue that, “providing alewives with access to their historical spawning areas will enhance the recovery of cod and other gadids and perhaps encourage the reformation of metapopulation components along the northeastern New England coastal shelf” (Ames and Lichter 2013). River herring were historically harvested with a variety of different gear types, including weirs, seines, dip nets, drift nets, and set nets (Atkins 1887). 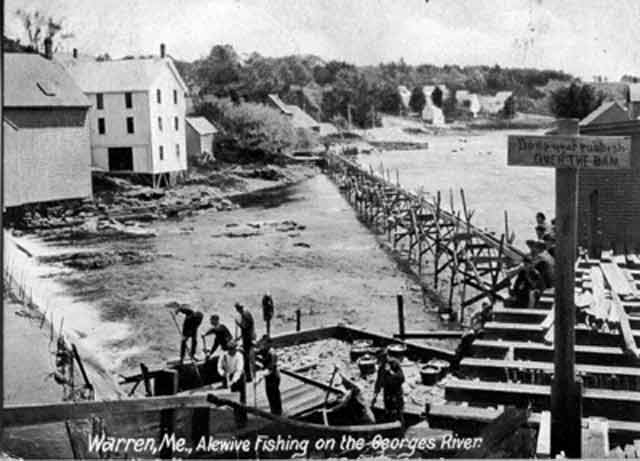 Weirs were used both by Wabanaki peoples and those of European descent to capture river herring, shad, salmon, and eels in Downeast Maine throughout the nineteenth century. Weirs are structures that guide migrating fish into a pen or trap. They were generally erected in tidal areas of coastal rivers and streams. Weirs could be used to catch different species of fish at different times of the year. They could be modified to capture fish migrating either into or out of rivers by simply changing the position of the trapping device (Atkins 1887; Prins and McBride 2007). An 1887 report of the U.S. Fisheries Commission describes two principal weir designs which were used extensively at the beginning of the nineteenth century. One common design included a mesh enclosure supported by stakes driven into the ground and interwoven with brush. A net blocked the path of migrating fish and directed them towards a pen. As the tide retreated the fish would be left exposed on a board floor and were easily retrieved by fishermen. The other commonly used weir type, the seine weir, was similar in shape and method of intercepting migrating fish; however, it lacked floorboards. In this case, fishermen surrounded the inside of the pen with a net called a seine. The bottom of the seine net was then pulled together, enclosing the fish. This was usually done at low tide. Unlike the floored weir, fish caught in a seine weir remained submerged until harvest, ensuring their survival even if fishermen missed the tide (Atkins 1887). Dip nets were also used extensively to catch river herring in the nineteenth century, particularly in East Machias and Dennysville. A dip net consists of a large net hung on a rounded steel bow at the end of a long pole. Dip netting was done by hand in areas of rivers and streams where river herring were constrained into tightly packed basins. Platforms were built over some streams to facilitate dipping (Atkins 1887). Records tell of the use of other types of nets including drift nets, seine nets, and set nets to capture river herring; however, these methods were probably rarely used in Downeast Maine (Atkins 1887). Most river herring harvests in Maine are managed at the municipal level. Historically, municipalities granted rights to the fish either to “fish committees” or sold them to individuals through an auction. Citizens of the town in question were usually assured a fixed price for limited quantities of river herring. In some cases there were provisions for people in need to be supplied with fish free of charge (Atkins 1887). Municipal management of river herring runs persists to this day in Maine. Runs are managed jointly by municipalities and the Maine Department of Marine Resources on a river-by-river basis. Fishery management plans must abide by guidelines set forth by the Atlantic States Marine Fishery Commission, an interstate agency that manages river herring harvests coast-wide. Rights to fish are, in most cases, still sold to one or two individuals in each town. Human activity in Downeast Maine impacted (and continues to impact) river herring and other anadromous species in a variety of ways, not all of which were negative. For example, beaver dams likely blocked anadromous fish passage in many New England ponds and streams prior to European colonization but by the eighteenth century the European fur trade had greatly reduced beaver abundances throughout New England. This reduction in beaver populations opened up fresh water habitats that had likely been inaccessible to river herring and other anadromous species for thousands of years (Jordaan et al. 2008). Unfortunately the balance of human impacts on river herring populations over centuries of use did not play out in favor of river herring. Though residents of Downeast Maine have harvested these species for centuries, river herring populations did not show evidence of major declines until dams became a popular method of energy generation, particularly after the development of hydroelectric technology. Dams that powered sawmills, textile mills, grist mills, and paper mills, many of which were later modified to generate electricity, were important drivers of economic and population growth in Downeast Maine and throughout New England; however, economic progress did not come without costs. River herring likely once spawned in almost every freshwater pond and stream in New England with access to the sea. Access to many of these spawning areas was either greatly reduced or eliminated entirely by the construction of dams (Atkins 1887; Rounsefell and Stringer 1945; Collette and Klein-MacPhee 2002; Natural Resources Council of Maine 2003). Compared to other areas in New England, Downeast Maine has always had a relatively low human population density and so rivers in this area remained free of dams longer than neighboring areas (Rounsefell and Stringer 1945; Maine Office of GIS 2006); nonetheless, several dams were ultimately built in this area and local river herring populations suffered the impacts of significant habitat reductions in the nineteenth century (Rounsefell and Stringer 1945). Fishing pressure likely played a role in the decline of river herring populations in Downeast Maine and surrounding areas, especially during the 1960s and 1970s. Declines in river herring harvests in the 1960s and 1970s have been attributed to the activities of foreign fleets which harvested great quantities of river herring off of New England. The 1976 Fishery Conservation and Management Act put an end to foreign fishing off the coast of the United States and took some pressure off river herring populations (Atlantic States Marine Fisheries Commission 1985). In response to declines in river herring abundances, NOAA Fisheries (the federal fisheries management agency in the United States) designated both alewives and bluebacks as “species of concern” in 2006 (National Marine Fisheries Service 2009). In 2013 the agency went through the formal process of assessing whether or not both species warranted listing as either threatened or endangered under the Endangered Species Act. NOAA concluded that listing was not warranted, but continues to have concerns about the status and threats to these species. Both are still considered to be “species of concern” (National Marine Fisheries Service 2013). Though river herring populations in Downeast Maine have been seriously impacted by human activities, many restoration efforts are underway to restore their populations to historic abundances. River herring stocking efforts do not rely on hatchery-raised young, but instead use adults transplanted from neighboring watersheds. Both alewives and bluebacks return to spawn in the ponds and streams where they hatched (Collette and Klein-MacPhee 2002); thus if adults in spawning condition are moved from a stream with an abundant population to one with a smaller population, the adults themselves will not return to that location to spawn, but their offspring, born in that pond or stream, will. Stocking can help maintain river herring abundances; however, transplanted fish could contribute to a loss of genetic diversity within the population as a whole. As restoration efforts continue to open up historically available river herring habitat, there is hope that Downeast Maine’s rivers will once again support high abundances of river-running fish and the many predator species that once relied on them. To learn about Downeast Maine’s modern-day river herring fisheries and recent restoration efforts, visit the Fisheries Now section of this site. Atlantic States Marine Fisheries Commission (ASMFC). 1985. Fishery management plan for American shad and river herrings. ASMFC Fisheries Management Report No. 6, Alexandria, VA.
Baird, S.F. 1873. United States Commission of Fish and Fisheries Report of the Commissioner, Part II: Report on the Condition of the Sea Fisheries of the South Coast of New England in 1871 and 1872, with Supplemental Papers. Washington, DC: U.S. Government Printing Office. Harper, B., and D. Ranco. 2009. Wabanaki traditional cultural lifeways exposure scenario. Prepared for the Environmental Protection Agency in collaboration with the Maine Tribes, epa.gov/region1/govt/tribes/pdfs/DITCA.pdf. Maine Historical Society. 2010. To 1500: People of the Dawn, mainememory.net/sitebuilder/site/893/page/1304/display. Maine Office of GIS. 2006. Impoundments and Dams. GIS file compiled from data from the U.S. Army Corps of Engineers, maine.gov/megis/catalog/. National Marine Fisheries Service. 2009. Species of concern: river herring, Fact sheet, nmfs.noaa.gov/pr/species/concern/. National Marine Fisheries Service. 2013. Endangered and threatened wildlife and plants; endangered species act listing determination for alewife and blueback herring. Federal Register 78(155): 48944-48994. Nobleboro Historical Society. 2013. Fish Facts. Damariscotta Mills Fish Ladder Restoration Project website, damariscottamills.org/fishfacts.html. Rounsefell, G.A., and L.D. Stringer. 1945. Restoration and management of the New England alewife fisheries with special reference to Maine. Transactions of the American Fisheries Society 73(1):394-424. Schalit, N., L. Winter, and G. Wippelhauser. 2003. All about Maine alewives. 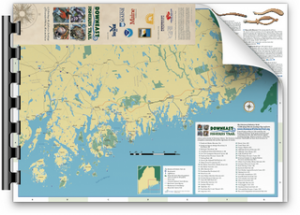 Fact sheet, maine.gov/dmr/searunfish/alewife/alewife.pdf. Trumbell, J.H. 1873. On some early notices of New England fishes, in United States Commission of Fish and Fisheries Part I: Report on the Condition of the Sea Fisheries of the South Coast of New England in 1871 and 1872, with Supplemental Papers (S.F. Baird). Washington DC: Government Printing Office. Watts, D. 2012. Alewife: a documentary history of the alewife in Maine and Massachusetts. Augusta, ME and North Easton, MA: Poquanticut Press.